As some of you are aware I’ve started this consulting role where, sadly, I have to get dressed, leave the house and go into an office. This is my idea of a living hell but, needs must and my mortgage isn’t going to pay myself. This is one of the reasons I don’t like going in. The women in the office have been giggling today. I didn’t know what was going on until I got a whiff of something different. Parfum? We are a company where there are too few men which means the effort level is low at best, invisible during winter. Being nosey I asked one of them what was going on? Eh eh, why would Jesus be coming to an old folks’ centre in a predominantly Jewish area on a Wednesday? I thought he mainly worked the weekends? But no, not the Messiah but, close. It’s a doctor that calls in every week to see someone in the building. 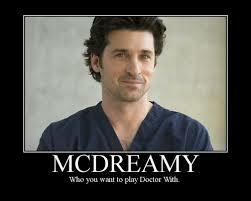 They’ve cleverly called him Doctor McDreamy. I saw a lipstick exchange hands. Didn’t these women know not to give arsenal to your competition? I have vaguely heard about McDreamy before. The occasional mention with giggle had occurred in front of me but nobody said that he was an actual doctor. Then it hit me: Yes, it wasn’t Jesus but this, this could be my FuHu (Future Husband) coming to save me from the prison that is office working. Technically speaking I was over 45 minutes away from home but there was no indication as to where he lived. And just think how over the moon my family would be if I landed myself a doctor. African parents are still peddling the doctor dream to little girls everywhere. I looked in my bag and there wasn’t any make up. Drat. This au naturel thing was freeing but wasn’t likely to catch me a man in an office of giggling goats. I had to think fast. I dig back into my Mary Poppins style work bag and come up with….impulse spray? The flashback of how Impulse used to make men crazy in the 80s forces me to sneak into the toilets and have a discrete squirt. I know my precious but, you never know. We all wait expectantly and then….HE arrives. I decide to play it cool and hold off on having a peek. Everyone goes out and comes back in, faux squealing. Clearly they didn’t manage to make any sustainable conversation because they’re all back in minutes. I look out into reception and can’t see anyone. I see a man out there but he’s standing with his back to me and must be shorter than me. Besides, his baggy bummed trousers are not appealing. I ignore him, put my shoes on and head out thinking McDreamy must be in a corner somewhere. But no. There is nobody out there except this man child bumless wonder. I walk out as if I’ve got somewhere to go and then promptly walk back getting a look at his face. He looks like a normal person. Not a celebrity, not a god and certainly not my FuHu! One of them: So am I? Me: And he doesn’t have a bum? All of them look confused. Me: Never mind. But seriously, he’s married? One of them: Is he? I’m done. I wish I could wipe the Impulse off my pulse points. What a waste of a secret squirt.